Riding a bicycle after months, oh what a great feeling. Nitya, Sridhar and I rode ahead, paused after a kilometer to let Manju catch up. 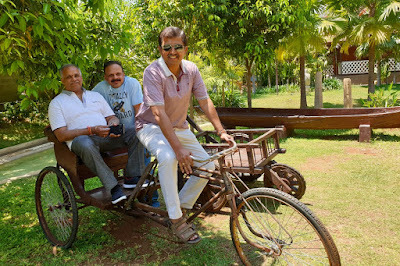 The road was smooth, bikes were comfortable, it was warm but the air was clean, enjoying the silent ride.. Here's a short video of our ride towards a pond and a hill in search of birds. That's our waterbody situated close to a small village. We parked and locked our bikes away from the road. 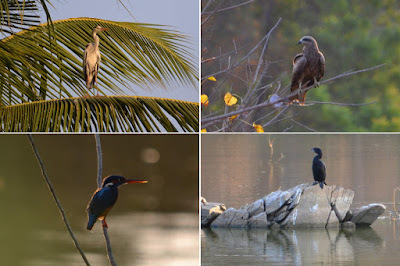 Manju spotted a kingfisher and couple of other water birds. The kingfisher was perched on a slender stem sticking out from the water. Sridhar patiently stalked it and got a good shot. I caught a cormorant resting on a rock island. A heron and kite hovered around but too swift for our lenses. 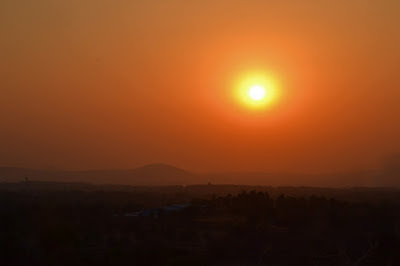 Sun was moving towards the horizon.. we decided to head to the hill. As we started riding I noticed a tall heron perched on a coconut tree. Can't ignore such a lovely creature, we paused, Sridhar got a good shot. Our winged friend took off before my lens focused on it. I was glad Sri captured it. 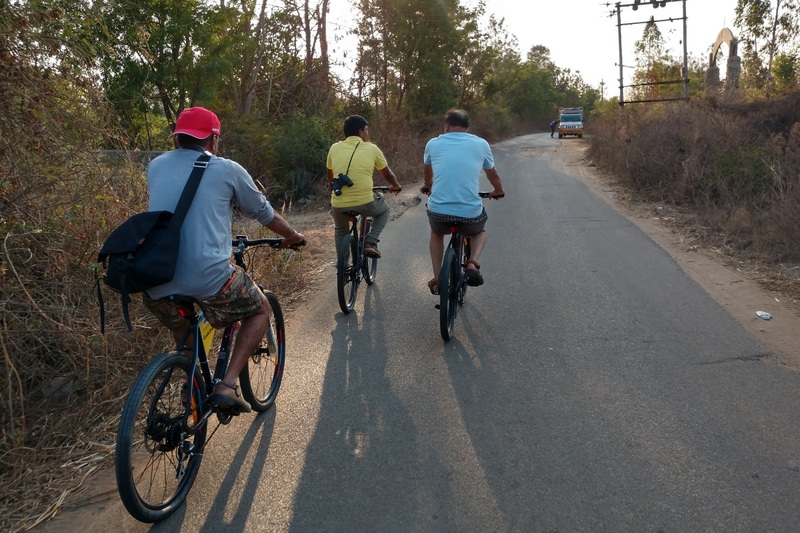 We rode a short distance and turned off the road into a narrow footpath. Bikes parked and secured with a chain lock we trekked the dirt path going along the rock littered hill. 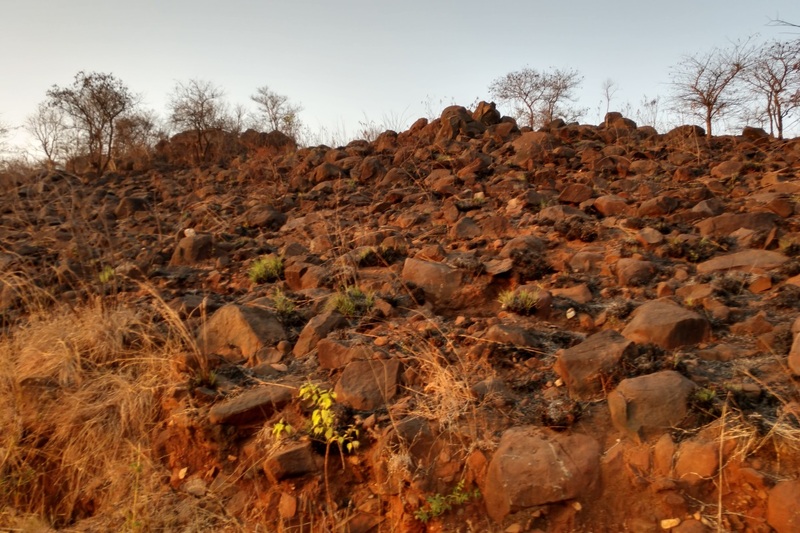 This is actually a group of two our three hills, all covered with dark colored igneous rocks.. this reminds me of Kappagallu near Bellary. 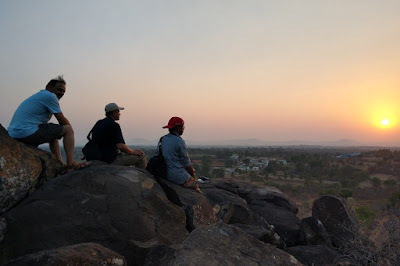 Manju said this hill is known as Yogavana Gudda. 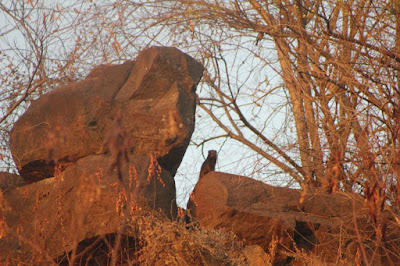 As we trekked, I spotted a big bird on a distant tree.. I alerted my team.. look, is that a peacock. Manju took one glance and identified it as Indian Kite. Indeed it was a Kite. Big fella he was. Both got decent shots before it dove out of view, seconds later we saw it pursuing another dark colored bird slightly smaller. Again Manju was resourceful. The other bird was an owl. First time I ever saw an owl and kite together. They were too swift for our cameras. Below is a collage of our captures. We had reached a point where we had to negotiate the path though the boulder ridden slope. 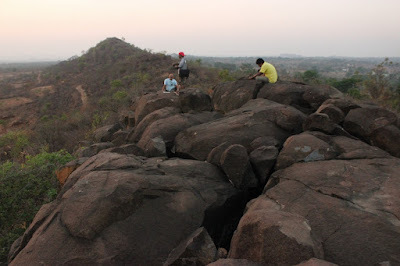 The rock at the summit caught my attention, aimed my Canon and clicked few shots. Manju wanted to know what I was shooting.. my answer was the rock, the part which is sticking up. Manju smiled and said that I had shot a mongoose. Wow, that was one big mungsee! This hill is interesting! 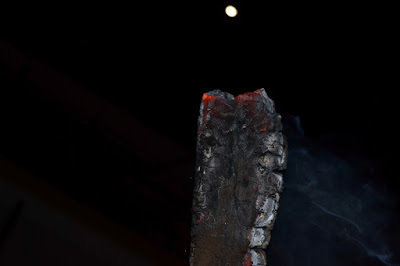 The rocks and gaps were covered with dark ash. It seems dry plants was burnt recently, controlled forest fire. Anyway, the climb the summit was easy. We made it on time to watch the sun set. Such a nice place this hill top is. Manju was carrying a binocular and a book on Indian birds. A few silent minutes watch the source of energy of our Universe. I explore the hill top and found some animal droppings. Manju quickly analysed the droppings, showed the hairy bits and bones.. these were leopard droppings. Looks like the leopard had had a rabbit somewhere and pooped up here. Wish we could explore the entire range.. we might have seen some interesting plants, insects and what not. Well, some other time hopefully. It was getting dim, we descended cautiously. The ride back was nice again, Hero ET-2 is an interesting mountain bike. I was seriously thinking of buying ET-3 for myself. Back at the resort, we parked the bikes and told our boys what a good time they missed. Back at my room which I shared with Prashanth and Subbu, I had a nice cool bath, refreshing it was. 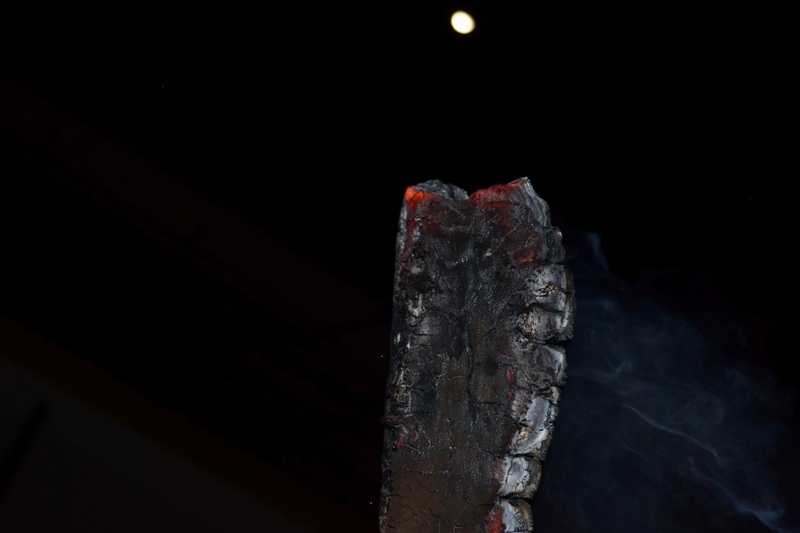 The gang had gathered around a bonfire in the courtyard next to the dining hall. Snacks were served, we prepared our drinks and glasses tinkled.. cheers! Our conversations touched school day antics, politics, personal experiences and so on. At one point someone sang a popular 70s Kannada movie number which lead to Daniel treating us with his singing. Then DM surprised us by singing a Hindi number. They took turns one after the other.. solo vocals concert in progress. In this group, most of them have known each other since 1977. Daniel joined in '80. I joined the school in '79 as a junior to this gang. 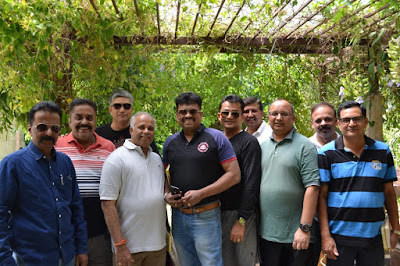 In '80 at the start of the term, I was given extra promotion and my seniors became my batch-mates. 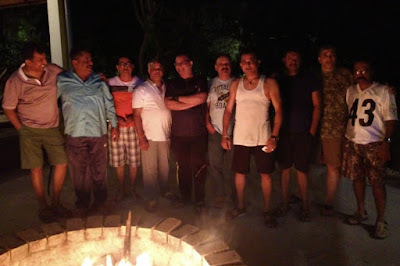 We were classmates for just 9 months but the remained friends for decades. Long live this relationship. 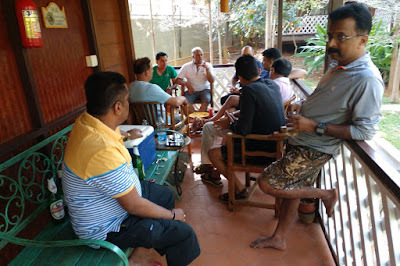 The session ended with dinner around 11. 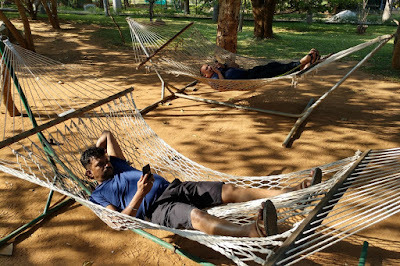 Most of us were tired, ready to hit the sack. We said goodnight. Here's one special shot for the evening by Sri. Being habituated to sleeping on hard surface I barely slept because the mattress and pillow were too soft. My eyes remained closed but the scenes and conversations of the day kept playing in my head. I got out of bed, freshened up and went for a walk. After a while I saw Satya and Nitya walking. We grouped, entered the cricket court, practiced throws and catches for a while. The plan for the morning was kayaking in a nearby stream. We had tea with DV team and prepared to leave for the stream. 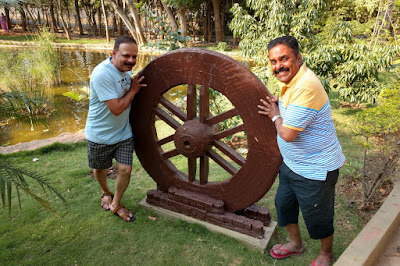 This octagon wheel welcomes visitors to Discover Village. 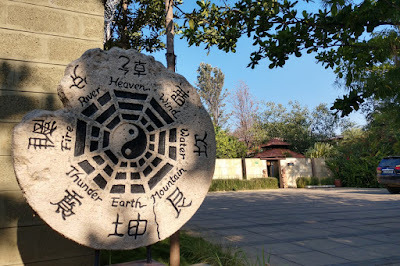 Yin-Yan and elements of the world we live in. Eight of us ready for an adventure. Daniel and DM decided to catch up with sleep. 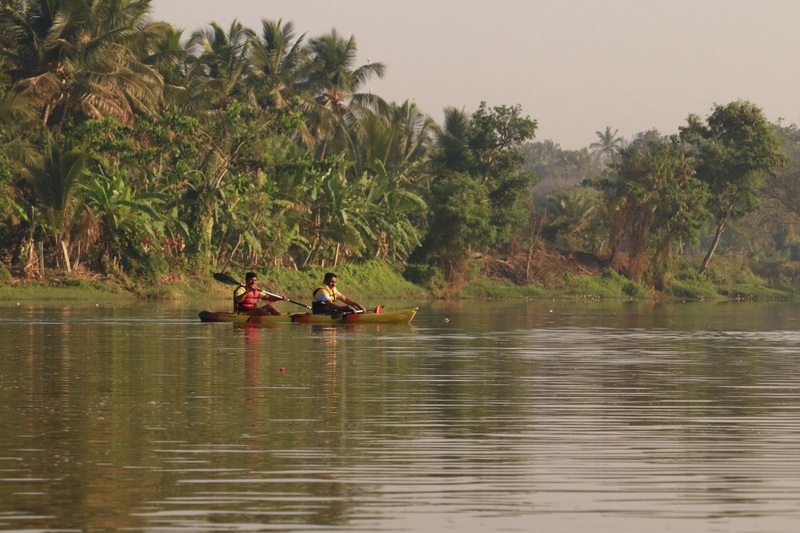 The stream was about 4.5 kms from the resort, on the other side of Bengaluru-Kanakapura road. 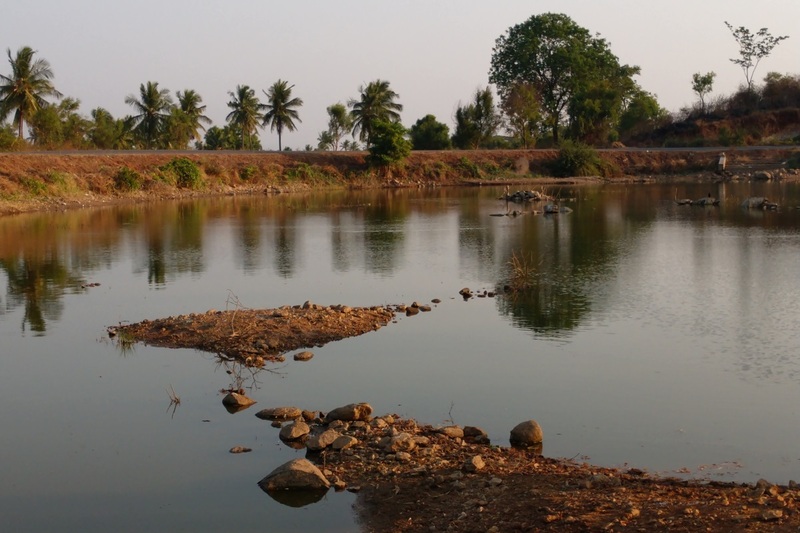 Of course, the stream runs dry in this season but a check dam had formed a water-body approximately a kilometer long and 200 meters wide. This isn't flowing water, good for first-timers. There were 3 two-seat boats. DV team helped us wear life-jackets. Prashanth and Bhaskar decided to go with experienced DV guys while Satya and I wanted to go on our own. DV guides instructed how to use the paddle and what to do in case we went overboard. The life jackets could keep a man afloat for 8 hours. I felt safe since the team was knowledgeable and also there were two fishermen in a coracle within earshot. Satya and I took some time figuring out the technique to maintain direction. 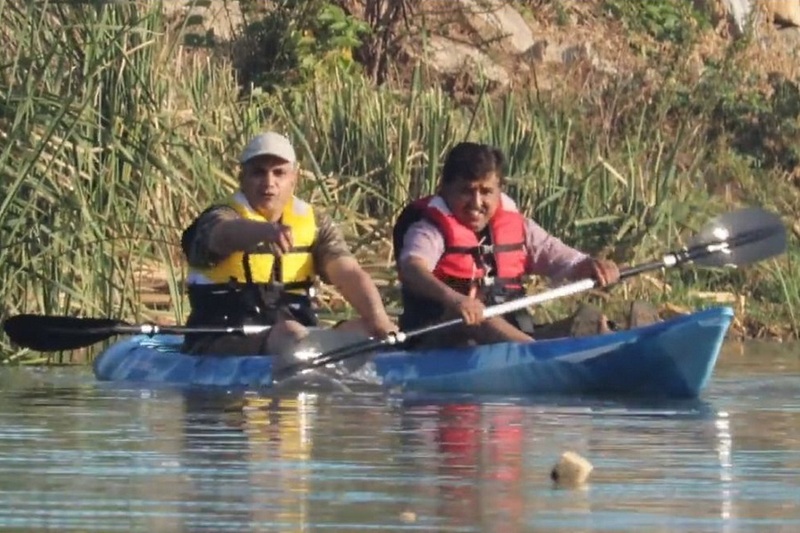 Initially we kept going in circles, no matter how well we synced our paddling. We would set some target and try to reach it. We did succeed after some 20 minutes of practice. That's me pointing at a fishnet buoy. Moments before earlier, we almost hit the shore, we managed to turn the boat around. Sun was up and our energy levels dipped, we ended our boating session. 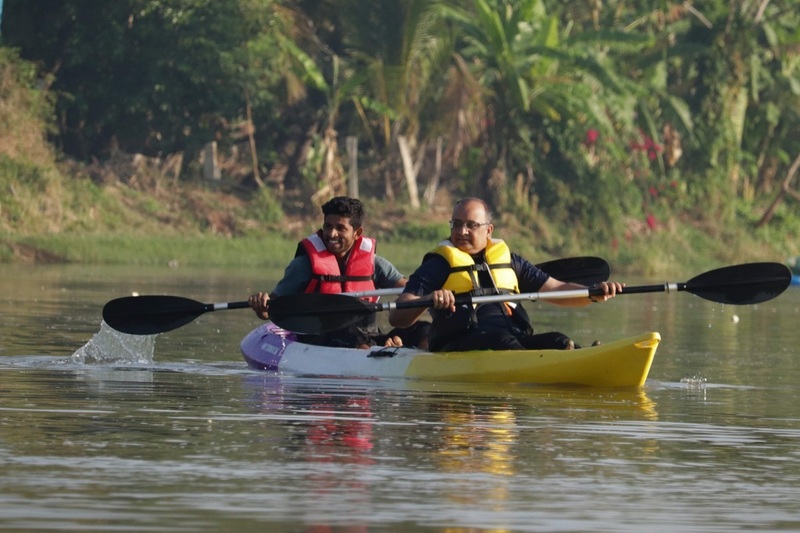 Back on the shore, we got to know that Subbu fell into the water while trying to board the boat. He was rescued quickly. Good the incident did not dampen his spirit. Back at the resort, we bathed and changed, had breakfast. DV team asked if we wanted to get into any other activity. No, we just wanted to chat around sipping coffee or water. After a while, we packed up and were ready for checkout. So, here's the DV team who made our stay pleasant and memorable. Thanks to them and also to the folks who are not seen here. The ten young dashing men who know each other since late 1970s to 1981. Of the few resorts I've been to, DV has been the best, unique too. What made it special is its sensitivity to Nature and a touch of spirituality. DV gifted us all with a copy of Bhagavadgeeta each, could choose between Kannada and English versions. Two most photogenic boys of this gang. These two mustache guys are Dwarapalakas, cool dudes. Check out their stance. Lot of sweet memories from this place. It was quite some since I met Holy Saint School boys last, which was Aug-2016 at Krishna Rao Park. The idea of an overnight gathering was formed sometime mid-Jan with tentative date in Feb. After one or two iterations date and venue were frozen.. Mar-16th and 17th at a resort near Ramanagara. While the idea remained frozen, the list grew from 5 to 11. 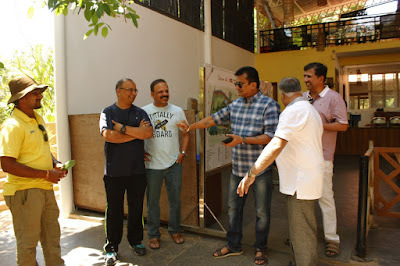 With less than two weeks to go the idea thawed suddenly.. an alternate venue was thrown in, discussions followed which resulted in changing the venue to a resort off Bengaluru-Kanakapura highway. The chief organizer Subbu struck the gavel and finalized the plan- check into Discovery Village on Mar-16th morning, spend the night there and check out Mar-17th. The last point ticked off some excitement! Bring Your Own B****? Shyam messaged the group that he was down with cold, dropping out. Hmm. Daniel picked me up on Richmond Road. By then the boys had already having breakfast at Krishna Grand, BSK II stage. We were behind schedule.. Subbu called Daniel to check.. Daniel answered that he wont be making it because relatives had landed at his place.. with the phone on speaker.. Subbu was disappointed and became emotional.. what Daniel, you can't do this, you are the key to this plan.. Daniel carried on with his bluff.. what can I do when relatives turn up, have to attend to them.. so damn convincing he was! 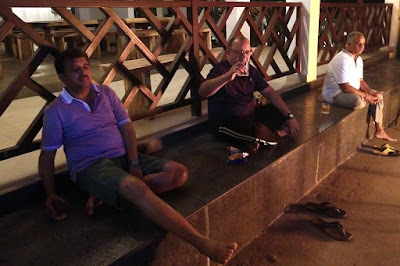 To end Subbu's plight I stepped into the conversation, told we would be joining in minutes. We had a good laugh at the breakfast table when Subbu said he knew Daniel was bluffing :) Besides the confirmed group of ten, we met Dinesh S and Mahesh, neither were joining us. The former was with his relatives and latter had come to say hi to us. Done with breakfast, we were ready for the 26 kms journey. 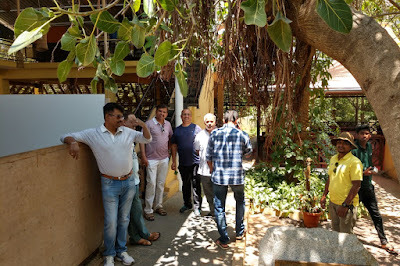 It was around 11-30 when we stepped into Discovery Village, the reception area was cool, greenery everywhere, plenty of antiques to marvel at, and DV team was friendly. 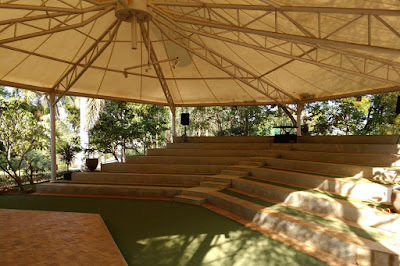 The place's ambiance is is really relaxing and photo friendly, so many subjects to shoot. Some of the antiques are not display items like the cycle-rickshaw and the 3-wheel wooden barrow. I'm the pillion while Daniel's the rider. 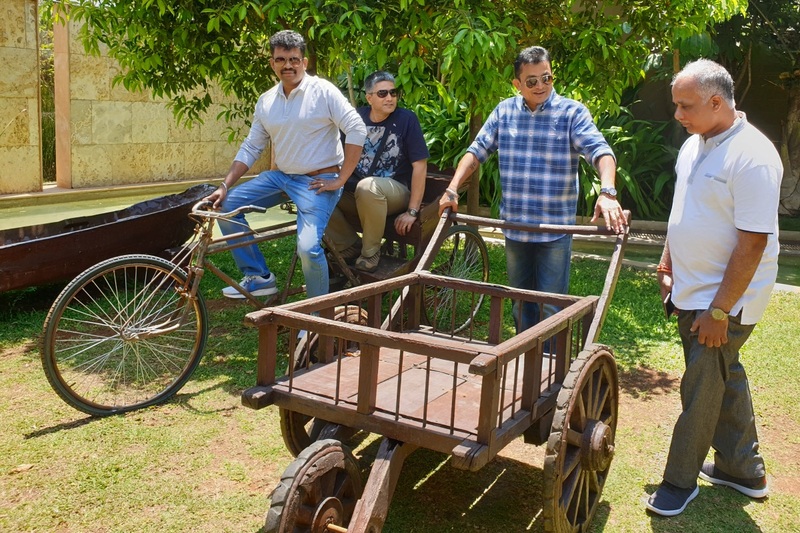 DM and Prashanth check out the barrow. 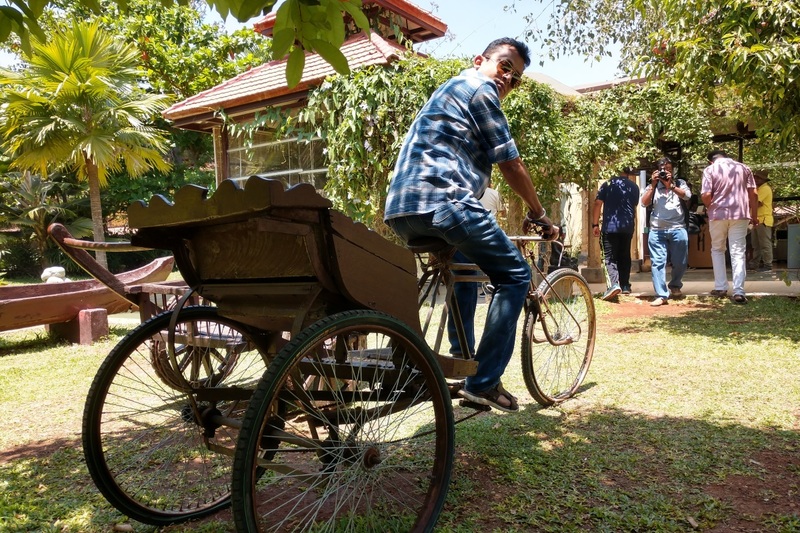 Satya takes over the rickshaw while Prashanth and Nitya are his fares. You must have noticed the boat in the background and the surrounding greenery. The rickshaw is working condition, you can actually pedal it. 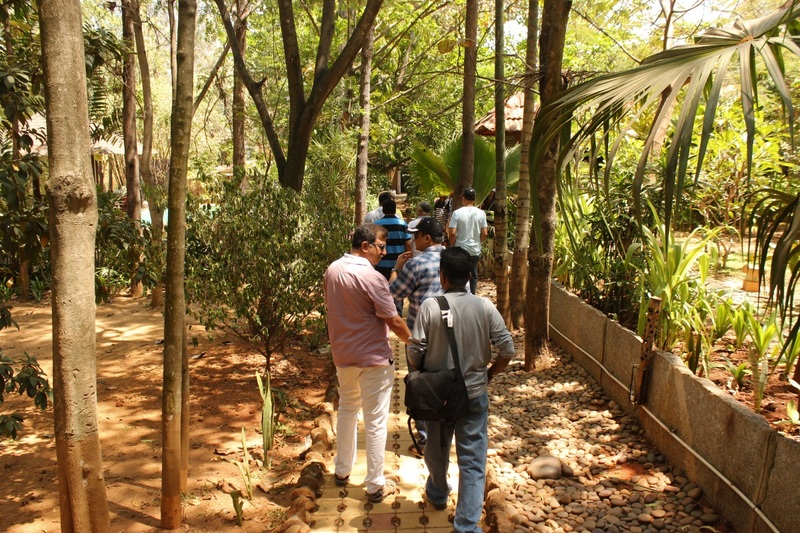 DM checks it out as Sridhar aims his Nikon. Subbu had handled the check in. 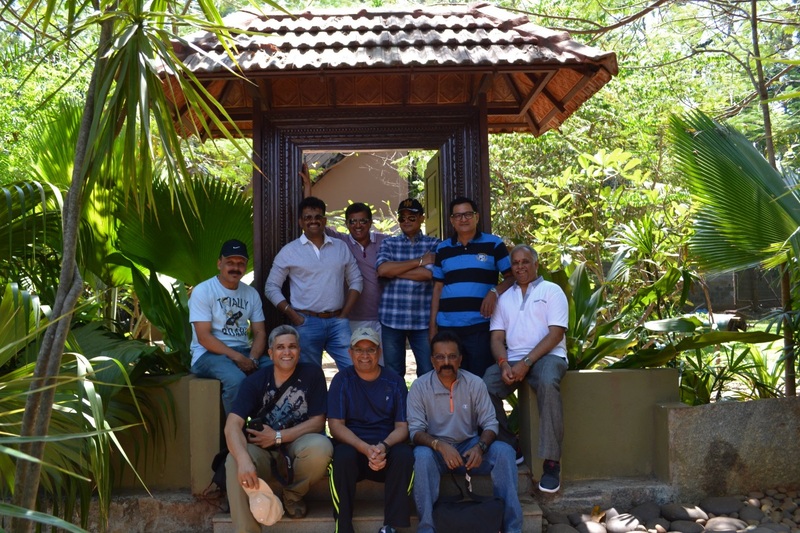 Oh let me introduce properly.. left to right.. Sridhar, Satyaprakash, Subramanya, Nityannda, Dinesh Magar (DM), Daniel, Prashanth.. hmm.. two boys are missing.. Bhaskar and Venugopal. Having checked in, it was time for welcome drink. The amount of greenery amazed me, I admired the management's attitude towards Nature. I thought of Krishnae Ficus.. I must mention it to the staff here.. Looks like Subbu read my thoughts, he pointed me to the Krishnae Ficus. Wow, what a pleasant surprise! A well grown ficus it was. I fell in love with DV. You can see the thick dark green cup-shaped leaves in the foreground. The divine connection is that Lord Krishna ate butter from these leaves. This is the second surprise with Subbu and Krishna Ficus. The first surprise was on Dec-27-2014 at Lalbagh.. Krishnae Ficus at Lalbagh. 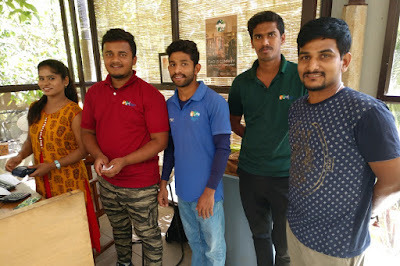 The young man in yellow tee is our host-in-charge, his name is Manjunath Ambigyar. 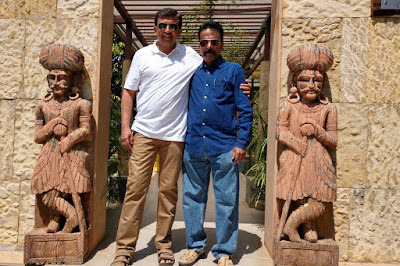 I was happy to learn that his home town is Anegundi, an important historic site in Karnataka. DM amuses the group with some story. 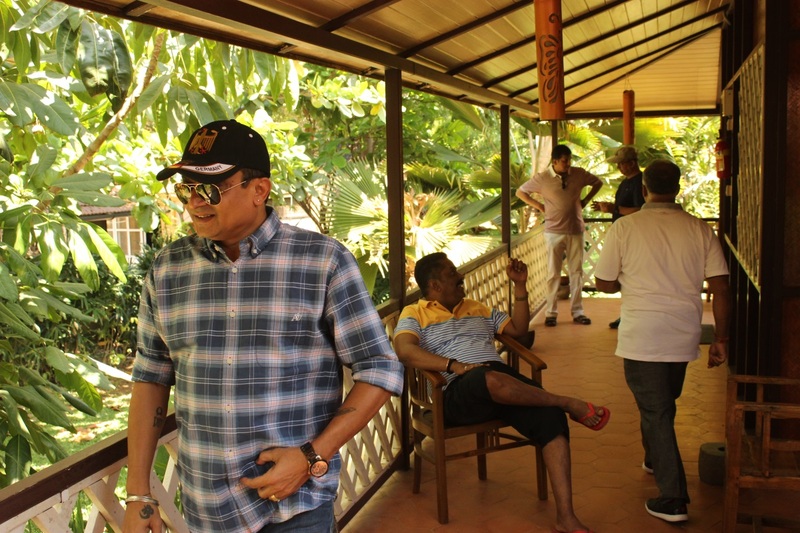 Manju offers us to take a quick tour of the resort. We found one of the missing boys- Venu -his stripes are outstanding. 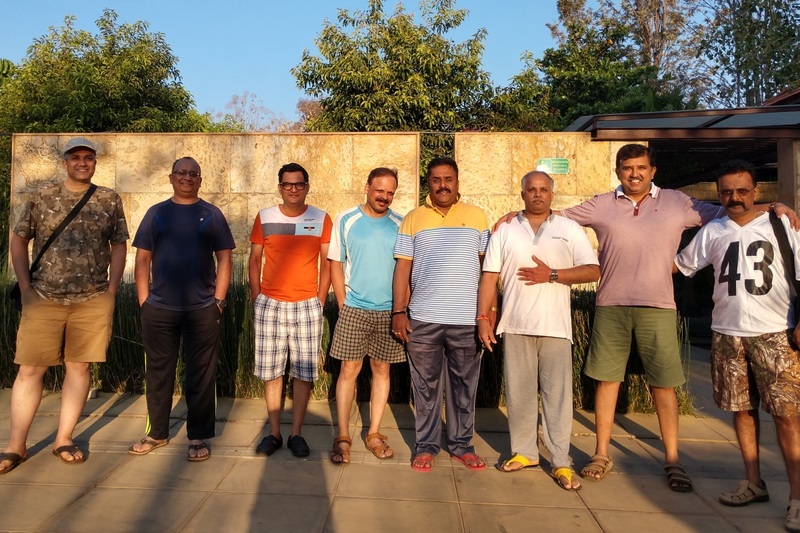 The resort has almost everything a vacationer expects.. swimming pool, volley ball court, cricket ground, football court, obstacle course, rock-climbing, cycling, etc. etc. Besides the usual stuff, DV has a fish manicure pond attached to the swimming pool, outdoor badminton court, mini golf course, archery, amphitheater, clay modeling & crafts studio and kayaks too. I might missed out few, you can discover them during your visit. 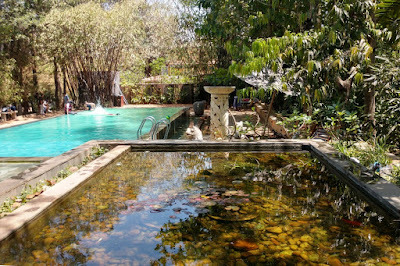 So that's the cool blue pool and manicure pond. We were to the end of our tour..
Manju suggested us to take a group picture at this photo spot. 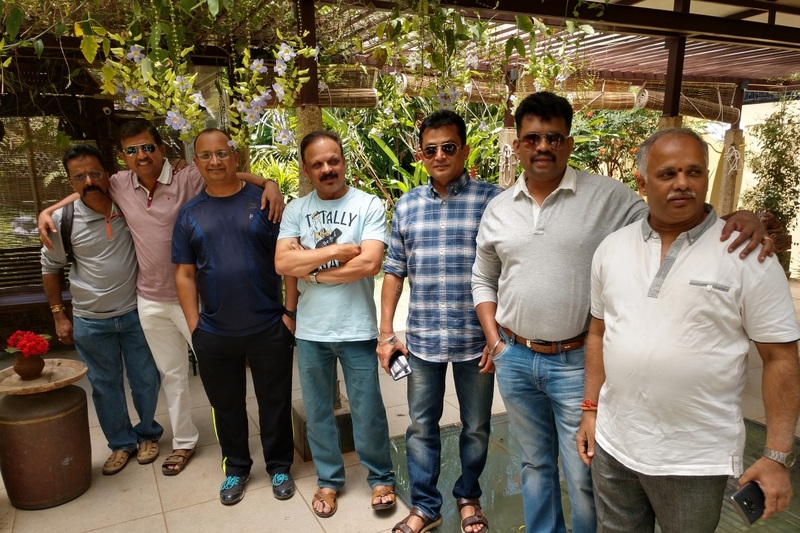 Nine Holy Saints here, Bhaskar is still missing. It seems he was taking calls from his office. We were thirsty now, decided to head to our rooms for some refreshments. 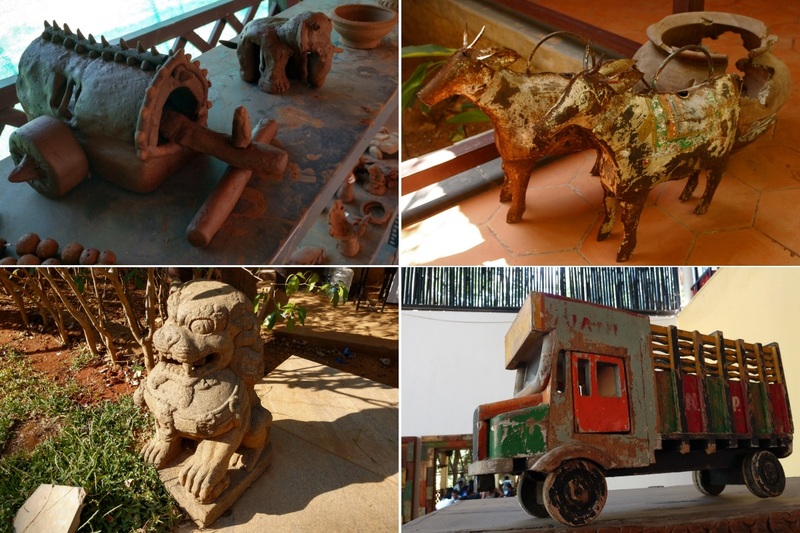 Here's a collage of few interesting things seen around the village.. clay cart and elephant, sheet metal oxen and wooden pot, wooden truck and a stone sculpture. This is our living quarters, the entire building of four rooms was occupied by us. Here's the missing boy Bhaskar, in yellow-blue tee. Mercifully his office people have left him alone now. Plan was to settle down for a mini session but the plan changed since lunch was being served and closes at 2-30. Lunch was decent. We settled down for a session, which lasted until 4-15 or so. Time to get moving again, we had plenty of options.. cricket, swimming pool, cycling, or trek. We headed towards the amphitheater. Tea & snacks were being served. A hot cup of tea was super refreshing.. matter of habit. Bhaskar in action now. 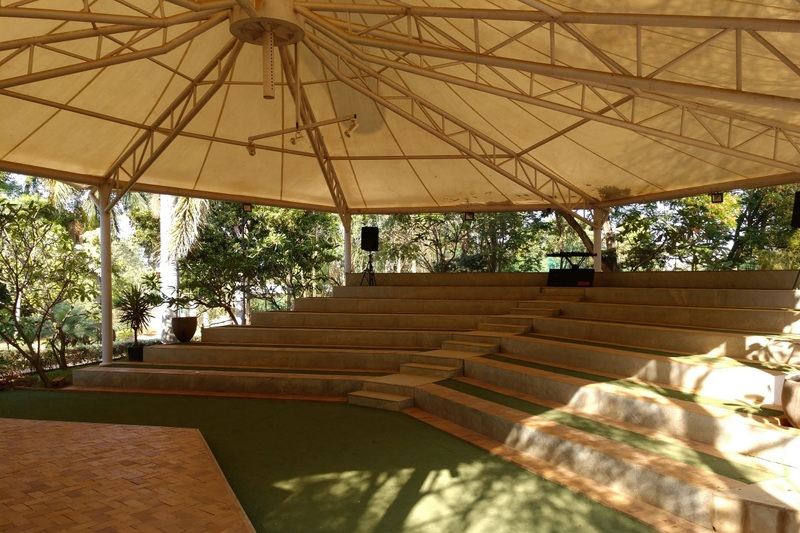 Quick look at the amphitheater. Looks cool and comfortable. 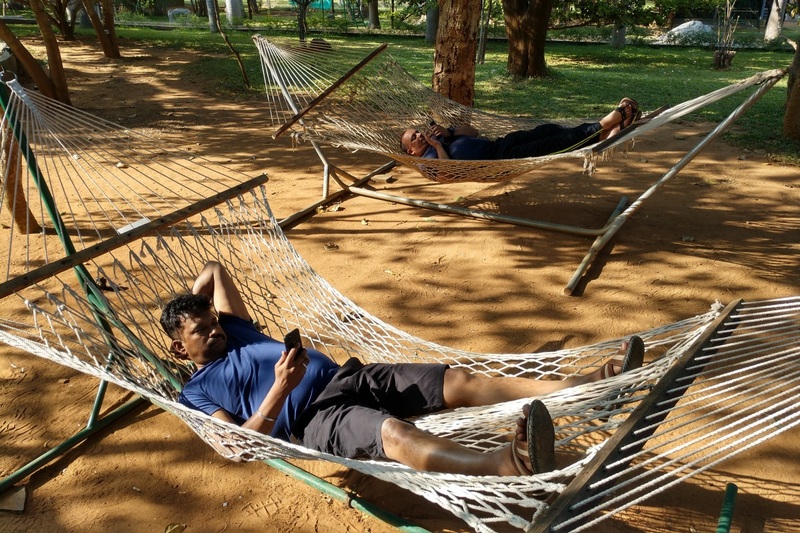 Daniel and Subbu take a short break to catch up with messages on their phones. Archery was something I wanted to try for a long time. As a kid, I used to make bows with sticks and twine, shot parkekaddi. I realized everyone in the group wanted to be an archer here. 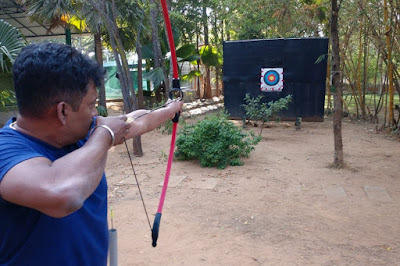 Manju explained us how to position the arrow, pull the string, aim & release the arrow. Someone in the group mentioned William Tell, his story was one of the English lessons. That's Daniel marking his target. Most of got the hang of it in few tries. It's a good sport for developing concentration. The other sport that fascinated is rowing, somehow I never chased it. Anyway, we had plans for kayaking tomorrow. 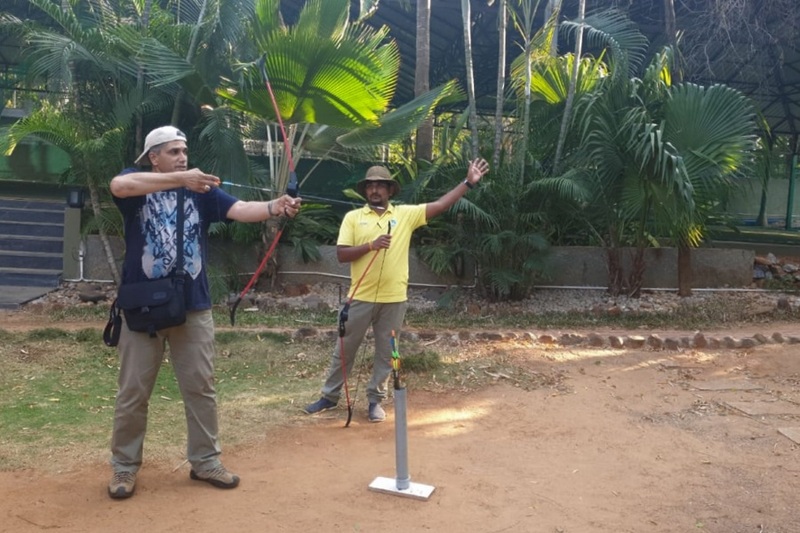 We had a good time with archery, great experience! Next we headed towards the pool. 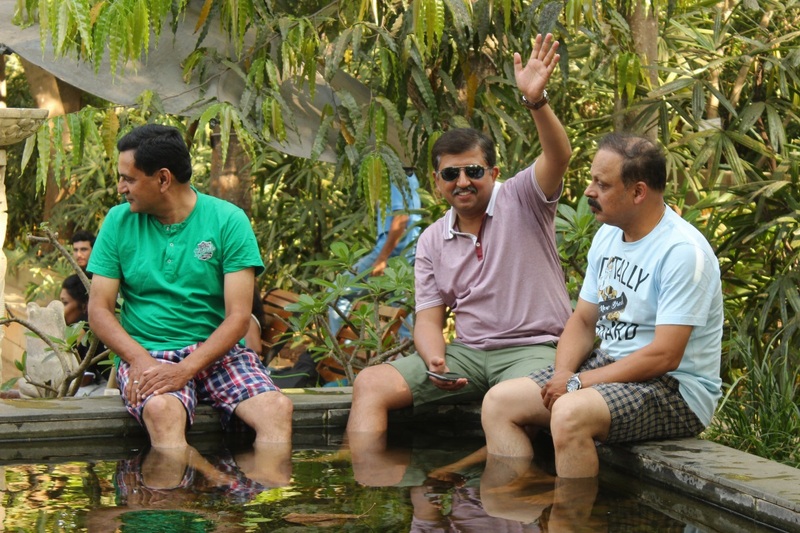 Some wanted to play in water but some were hesitant to enter the pool.. I was one. 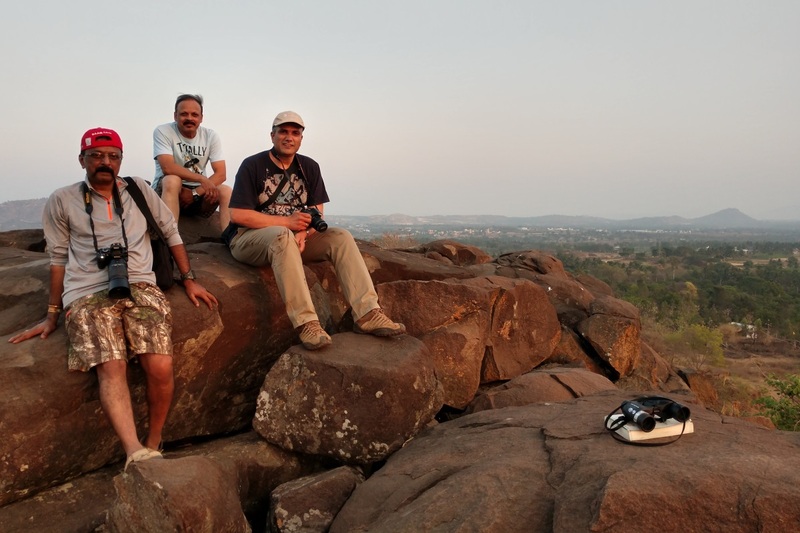 I'd rather go for a trek and Sridhar wanted to shoot birds. He's a pro at shooting metal birds too. I've seen his pictures of aircraft in flight at the recent Aero Show. 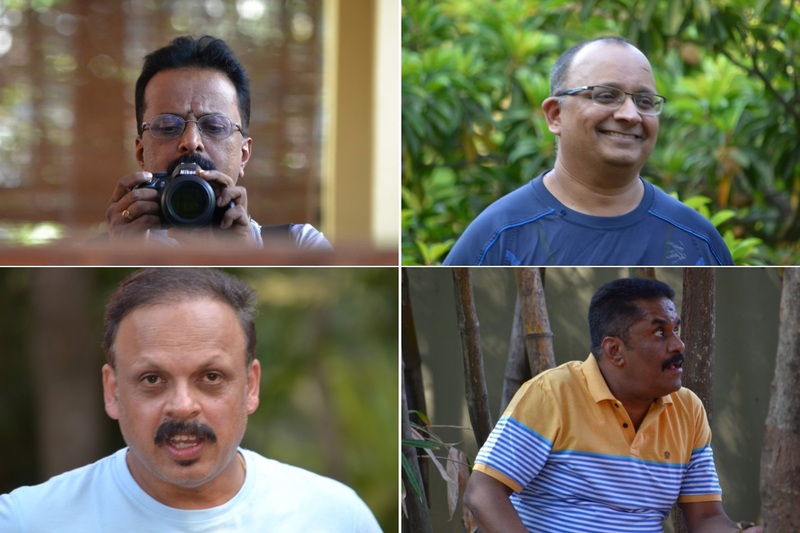 Here are a few candid shots.. Sridhar checking a shot in his Nikon, Subbu our Mestru, Bhaskar is captivated by some creature and Nitya's expression at a surprise shot. While some got ready for the pool, I inquired for a sunset point. Manju suggested one about 1.5 kms away. We could either trek or cycle to the hill. 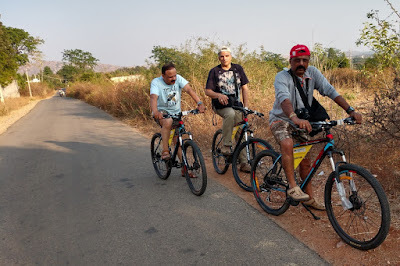 Sridhar, Nitya and I settled for cycling, bird-watching and trekking expedition. 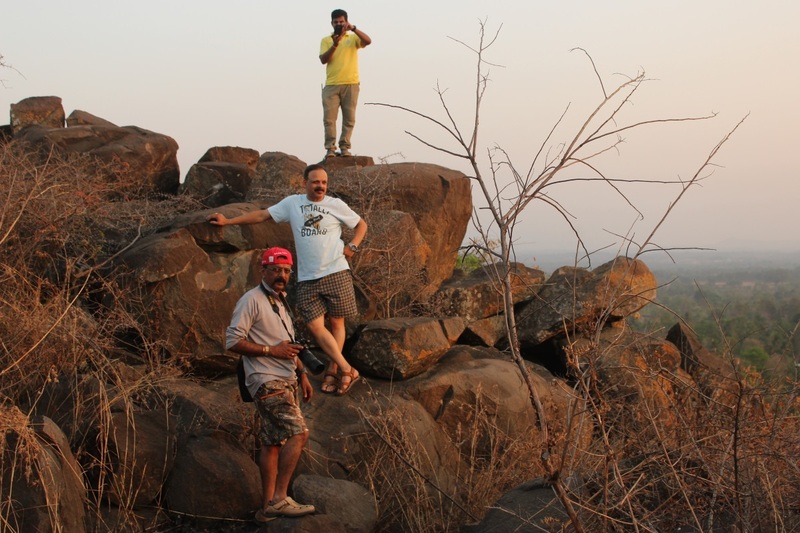 Manju would be our guide. We selected four brand new Hero ET-2 mountain bikes. In fact, we were the very first riders! 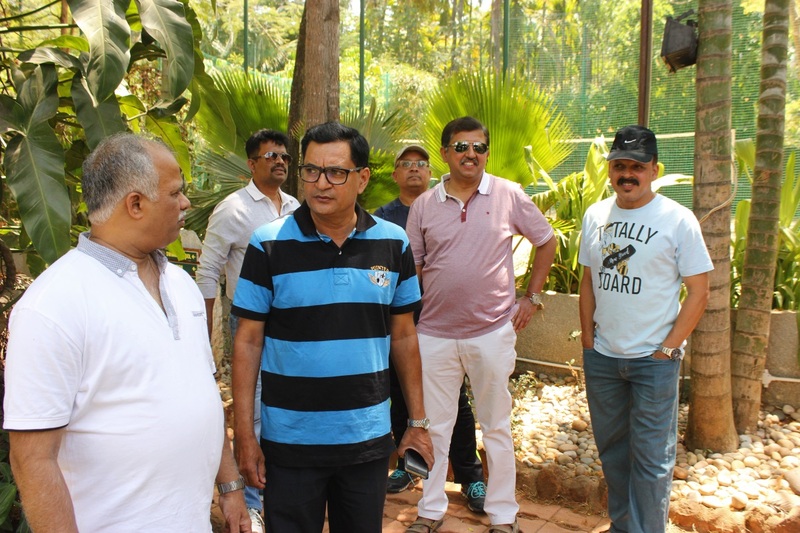 will continue in gathering at Discovery Village, Kanakapura Road - part 2.